Many of us have probably seen the child sized, portable, fold up chairs for sale in stores, but have you even seen the Go With Me Chair? Made by Kelsyus, these chairs are suitable for children ages 3 months to 6 years and consist of three main stages: sitting, standing, and big kid. 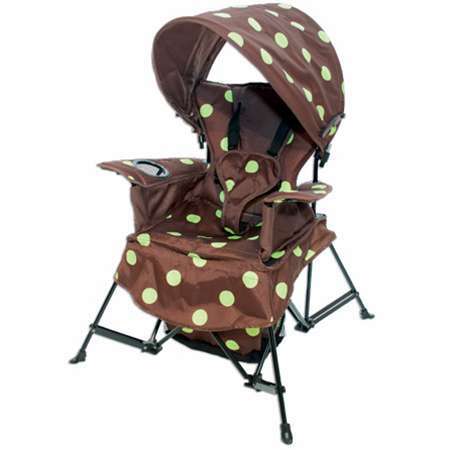 For the sitting stage there is a 5-point harness included to keep your little wiggle worm secure. If your child is just learning to stand there are leg holes under the seat flap and a foot bag to keep your child’s feet clean and away from hazardous things if used outside. Last, for the big kid stage, the 5-point harness can be removed and the foot bag rolled up and secured with Velcro tabs. Not only is the Go With Me Chair versatile, it also includes a cup holder, carrying bag with handles, a removable tray for toys and snacks, AND a removable sun shade! This looks like a great giveaway!!! Please be sure to enter as many times as you can to increase your chances of winning this great prize and also let others know so that they can enter too!! Good luck to everyone that enters! Have a great day! !